‘one stop rule’ for streetcars and buses, which would prevent 2 buses/streetcars from tailing one another. Reasoning: especially with streetcars, where one cannot pass another, they tend to bunch, with the front streetcar collecting all the passengers on a run, and the other will follow in its wake, with no passengers for the remainder of the route! A ‘one stop rule’ would leave adequate spacing between streetcars and buses, which is better resource allocation and improves service. As an economist, I mention that it is a pareto-efficient improvement, with no losers. I wanted to check again, if there was a reason for its implementation or non-implementation? The bracing of the gardiner already is ripe for such a structure, as there is no foundation to lay. All weight-bearing wall/trusses are already in the Gardiner structure. You can enclose a large area extremely cheaply with a ‘sheet of glass’ style architecture, which can be ‘hung across’ vast expanses to enclose the space. The Gardiner buttresses are ironically, already in a vault shape. Give incentives for developers in this space, it enlarges real estate and brings in extra taxation revenue for the city, through permit and property tax. An ‘Eaton Centre’ style mall down in this area will popularize the waterfront, (which I have read has been an iniative of yours, in your study of Chicago) by attracting people to the area. Tourists and residents alike. In visiting costal towns, I notice that there is always a commercial centre a few blocks inland from the actual coast line. This ‘mall’ would act as such a ‘base’, being a commercial center, steps to the water. Building a mallway underneath will reinforce the existence of ‘The Gardiner’ as a viable structure in the community and part of Toronto. (If not leaving it there, the other option is to tear it down, which is costly). This will cause no disruption in service to the highway itself, saving millions. Building one length of such a mall, would act as a pilot, and if successful, the length of the ‘mall’ could easily be extended easily (lots of room to grow). In my envisioning of such a project/structure, there is a public running and bicycle lanes as part of the throughway, (actually a loop) that allows runners to jog, and cyclists to commute for free in a clean-air enclosed environment. The runner/cyclists and commuters would support the retail stores in the area. Especially in the winter, this will indeed see even more use during the winter as a local draw. 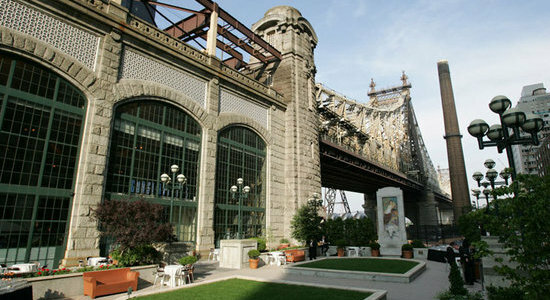 I refer to the restaurant Gustavino’s (a high-end restaurant) under the Queensborough bridge in New York, and other projects of this nature in England/New York, which have been very successful when executed properly. If done well, they are ‘unique’, Gustavino’s is largely considered an architectural masterpiece. Such unique structures add to the cachet and attractiveness of the city. Thank you very much, Mayor David Miller and your staff for handling this email. I hope it affects some change or will be used as an idea to strengthen other more deserving ideas for the improvement of the city. Here is the response from the Mayor’s Office. Thank you for your thoughtful email regarding the Gardiner. The Mayor appreciates the time you have taken to express your concerns. I can’t find your original email about vehicle spacing. Please feel free to resend it. The TTC takes the problem very seriously and is addressing it in a number of ways. In the past drivers and supervisors had to report service irregularities and typically short turned a bunched vehicle into a gap in the opposite direction. Later this year the TTC will be rolling out live, GPS-based vehicle tracking that will allow supervisors and the public see exactly where every vehicle is. This will allow far more thorough identification of service problems and facilitate their resolution. The biggest cause of bunching is inadequate vehicle size, which leads to overcrowding and long dwell times and stations. Surface transit typically is most effective when the vehicles are several minutes apart. Any service running under three minutes apart risks becoming uneven. The TTC is dealing with this by upgrading services on its busiest lines by adding express service, building light rail lines, and, in the case of streetcars, moving to all door loading and longer vehicles. Much attention is drawn to the City’s efforts to tear down the eastern end of the Gardiner, but the City is, in fact, pursuing a number of different ways of making it more hospitable to pedestrians. At Fort York, for example, the we will be building a new visitors centre and park under the expressway as part or the bicentennial of the War s 1812. The City Place development east of Bathurst also includes an exciting new park that will help connect its neighbourhood to the waterfront. I have studied many examples from around the world where the land under elevated expressways had been reclaimed. They are overwhelming in sections with no off ramps. In fact, the challenge to doing more in the central section is more the off ramps than it is the elevated expressway. The number of lanes of vehicles, variation in vehicle movement and speed, cannot be solved through design treatments. Thank you for writing and sharing your concerns. Should you require further assistance, please do not hesitate to contact this office again.